There is possible, wonderful news coming from terrorist-controlled Syria, ISIS officials have announced that ISIS leader and torturer-in-chief Abu Bakr al-Baghdadi has been killed. If the story is true (it hasn’t yet been confirmed by the U.S.) it raises one very crucial question. What exactly does one send to a Shiva for an Islamic terrorist? Perhaps deli? After all, people who eat Halal can eat Kosher meat (but not visa versa). 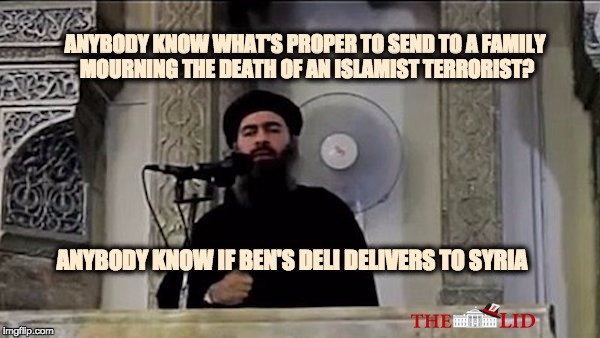 Anybody know if Ben’s delivers to Syria? Anyway, a little more than three weeks ago, Russia announced that they had killed al-Baghdadi just outside of Raqqa, Syria. However, no corroboration was forthcoming and the world was forced to wait for further details. The ministry said the air raid on May 28 that targeted an IS meeting held on the southern outskirts of Raqqa in Syria also killed about 30 mid-level militant leaders and about 300 other fighters. It said the military began planning the hit after getting word that the IS leaders were going to gather for a meeting to plan their exit to the south. “According to the information that is being verified through various channels, IS leader Abu Bakr al-Baghdadi also attended the meeting and was killed in the airstrike,” it said in a statement. The Pentagon said it had no information to corroborate the reports. Kurdish and Iraqi officials also had no immediate confirmation. But if it’s true, this report brings with it the hope that if the head of ISIS has been removed, perhaps the rest of the group will rot away.